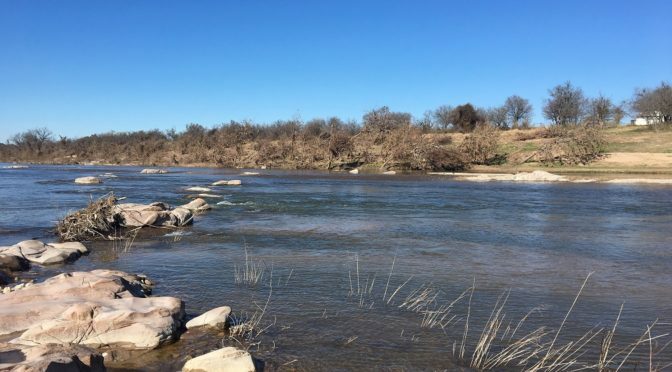 AUSTIN –The Texas Parks and Wildlife Department is expanding public fishing and paddling opportunities on the Llano River with four public access sites opening just in time for winter trout stocking this month. South Llano at County Road 150: A kayak/canoe launch and a quarter-mile of bank fishing access on the South Llano River upstream of Junction at the County Road 150 bridge crossing. Main stem Llano at Pete’s Pecan Patch: A kayak/canoe launch, 800 feet of bank fishing access and day-use picnicking areas surrounded by a historic pecan orchard near Junction at 325 Kimble County Road 3121. Main stem Llano at Castell Crossing: A kayak/canoe launch point and 950 feet of bank fishing access on the main stem of the Llano River at Castell Crossing on FM 2768. Main stem Llano at HR Seventh Heaven: A kayak/canoe launch and parking for vehicles and trailers near the City of Llano at County Road 103 (Schneider Slab Rd). Although all of the sites are now open for public access, historic flooding on the Llano River in October 2018 impacted some amenities at the sites including signage and kiosks. Anglers and paddlers hoping to utilize these sites should keep in mind that they are mostly in a natural state, meaning no staff, restrooms, running water or other features they would expect from a park. A map, area descriptions and special conditions on public use for each site can be found on the TPWD website. To provide seasonal fishing opportunities for anglers and paddlers while the weather is still cool, TPWD will be stocking rainbow trout in the Llano River in late January in the reach downstream of Castell in Llano, at South Llano River State Park in Junction, and at the James Crossing in Mason at Highway 2389. Dates and directions to each stocking site can be found online in the TPWD rainbow trout stocking schedule. Although rainbow trout make for great winter fishing, year-round the Llano River is home to many popular sport fish including largemouth bass and the Texas state fish – the Guadalupe bass. Anglers are encouraged to practice catch-and-release of sport fish in this river, especially after recent flooding which may have displaced some of the native fish populations. 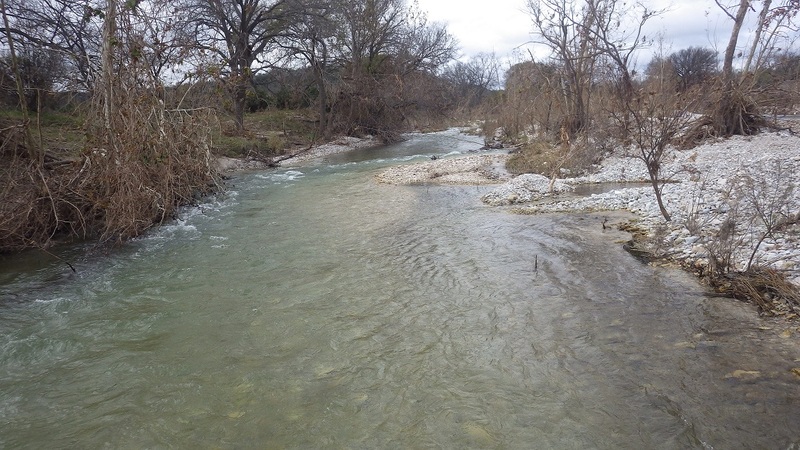 As part of the river access agreements with cooperating landowners, TPWD biologists will be conducting scientific surveys in the river this spring to monitor fish populations and streambank vegetation, and to identify opportunities for invasive species treatment and habitat restoration. Survey data will be used to ensure that increased public use does not have a negative impact on natural resources. The River Access and Conservational Areas Program is funded through donations to the Texas Parks and Wildlife Foundation, the Sport Fish Restoration Recreational Boating Access Grant Program, and by sales of the Texas Rivers Conservation License Plate. For pictures of the Llano River RACA sites, visit the TPWD Flickr album here: https://flic.kr/s/aHsmudrj9S. Not a bad way to start the new year in Seadrift, TX.! 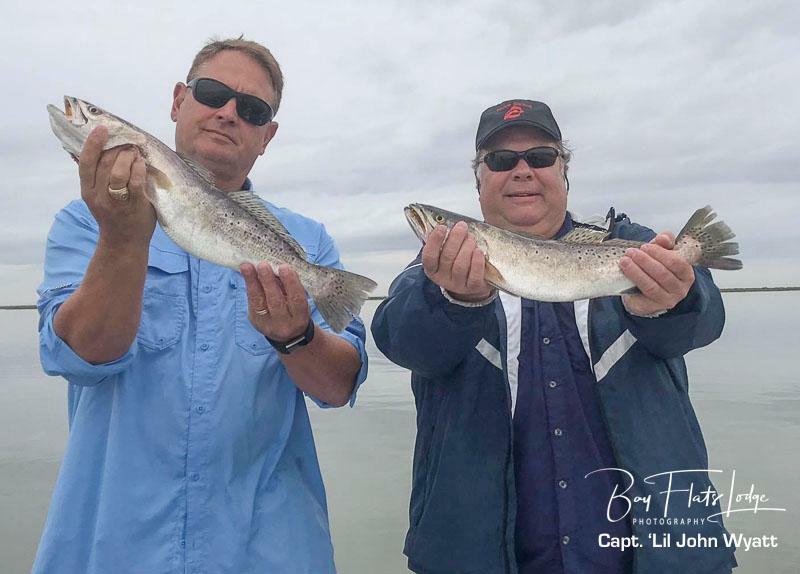 Little to no boat traffic and miles of shallow flats holding good trout from 17-27”. Our lure selection today ranged from DSL’s pumpkinseed to Corky fatboys and XL’s. Most fish were caught in knee to thigh deep water, wherever we could find concentrations of bait fish. Folks, if y’all haven’t booked with us in either Seadrift or Port Mansfield, TX. this winter, you are missing out. Fishing continues to be strong, and many great weather days ahead. Give us a call for availability in either location. Went out for a nice 4 days of hunting over the Christmas break with my son David (14) in search of a good cull buck. He got the job done Friday evening. I had spotted a deer before and had pictures of him and discussed with the lease manger. 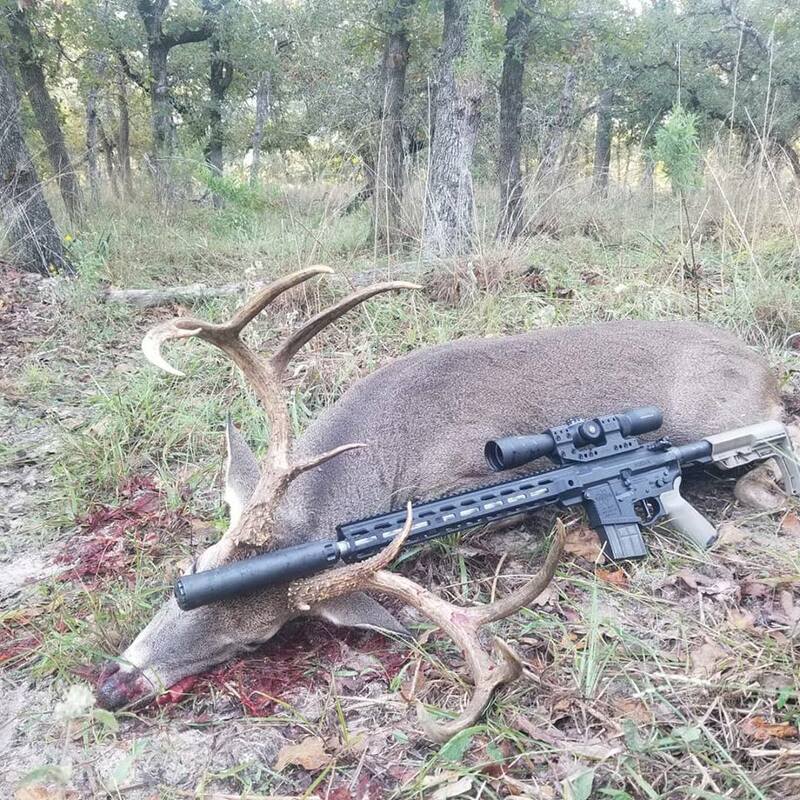 Definitely a targeted hunt for a specific deer that met ranch criteria. It came in Friday evening and it was windy. Deer were skittish and would just take off for no apparent reason. I saw the buck come in and told David “he’s back” and we shifted seats. He got the 7mm08 in position and it started to walk off into the brush, I said “he’s leaving, get on him but don’t rush the shot” BWAM—— sssscccchhhhhhtttt THWAP! IMPACT! Saw the deer take off, hit the ground, turn and run, hit the ground again and go off into the brush. I asked him how he felt about his shot, where he aimed, etc.. “In the leg” he said. “In the leg??? ! 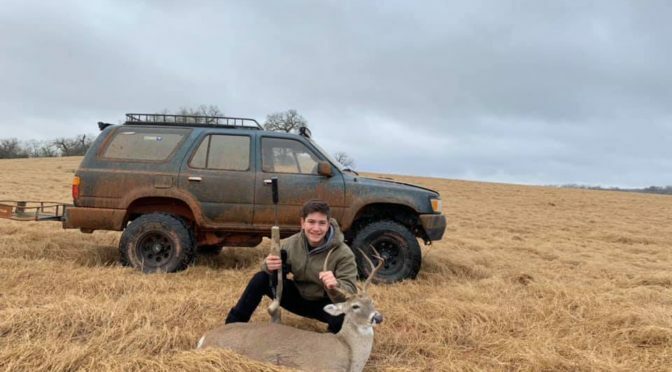 !” was my response.. “In the leg?” He was like, “well,, the shoulder” Ah.. ok, then he grinned and said “He’s dead” Confidence is everything.. We waited about 30 minutes and sure enough, there he was, laying down, antlers up. He made it about 30 yards total. Both legs broke. In the area we were hunting if a deer runs into the thick brush they can be VERY hard to find and people lose deer out there more often than they should. I would rather lose a few pounds of shoulder meat than a whole deer. Took some pics, high fives, loaded up and headed back to camp. Always funny to see everyone hanging around the cleaning station judging everyone else’s deer. My boy did good. We had a great 3 days of hunting this past weekend. Good times with my son and brother. Sharing the great outdoors with family and close friends is what it is all about. I am very thankful that we get to do this and I know my boys will remember these times as the grow old. Hopefully they are able to have good jobs and can afford to go hunting when they are old dudes! Getting harder and harder to afford good hunting and that is only going to get worse. We only shot a cull and a doe, but it was a great weekend! Good post-front bite today. Solid trout from 18-23” landed on DSL strawberry wine, victorious secret, and corky fatboys! All our fish were released today. We still have plenty of open dates for Seadrift fishing under our winter discount for Dec-Feb. give us a shout, you won’t be disappointed! 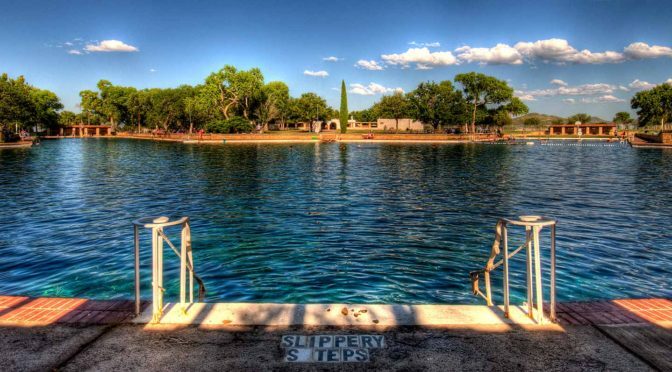 ODESSA, TEXAS– Dec. 06, 2018 – Saulsbury has announced a donation of $100,000 to the Texas Park and Wildlife Foundation’s Balmorhea State Park fund to repair the spring-fed pool at Balmorhea State Park. The pool was closed earlier this year following the collapse of part of the pool’s wall. In August, Apache Corporation established a challenge grant for the fund and will be matching Saulsbury’s donation as Texas Parks and Wildlife Foundation works to raise $2 million to repair the world’s largest spring-fed swimming pool. As part of their core values, Saulsbury is committed to supporting the communities in which its employees live and work. Throughout its 51-year history, Saulsbury has provided support to the community through in-kind donations, volunteer services and monetary support. The pool at Balmorhea State Park was closed in early 2018 following a structural collapse of a wall caused by years of erosion from the flow of water from the springs. The repairs to the pool at Balmorhea State Park are ongoing. The pool is expected to re-open in early 2019. 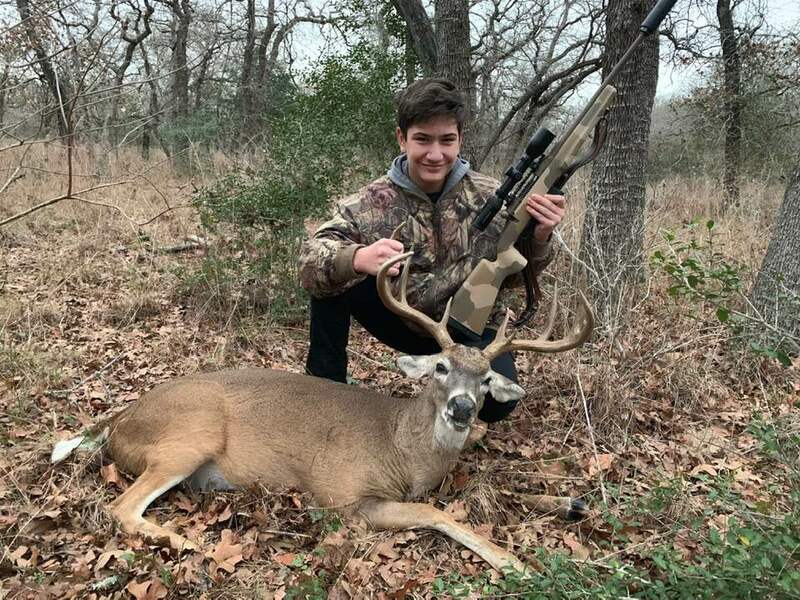 Texas Parks and Wildlife Foundation raises private funds to advance Texas’ proud outdoor traditions and conserve our state’s wildlife, habitat, recreational areas, and natural resources. Since 1991, Texas Parks and Wildlife Foundation has raised more than $170 million in private philanthropy to ensure that all Texans, today and in the future, can enjoy the wild things and wild places of Texas. 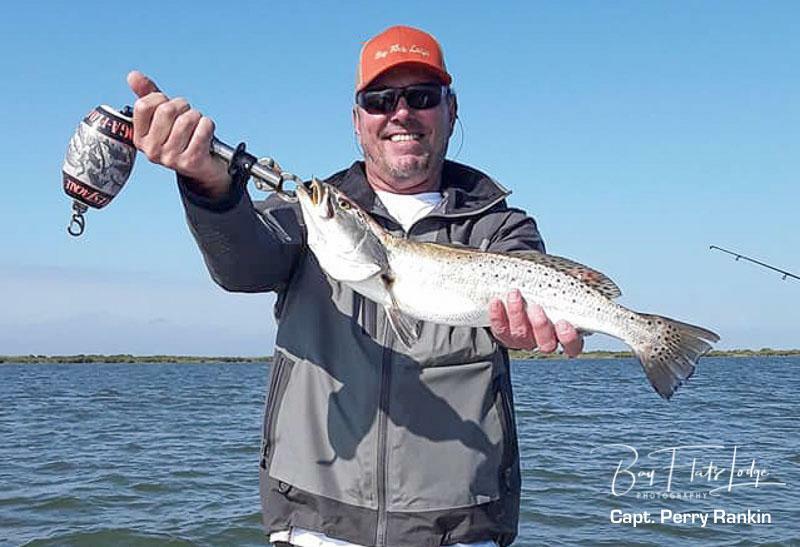 The Hunt for December Trophy Trout Continues at Bay Flats Lodge Resort & Marina! Capt. 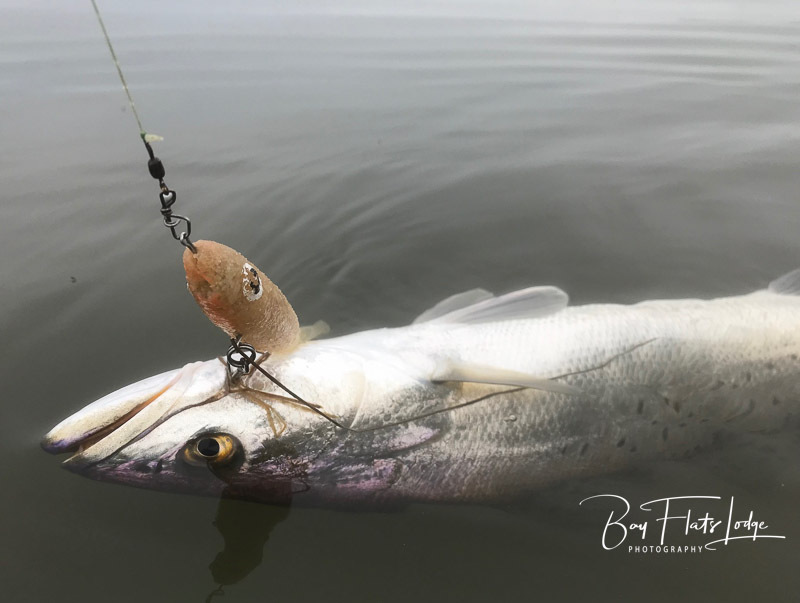 Stephen Boriskie– Good few days with calm conditions and pleasant temperatures made for some relaxation and trout catching on Vudu Shrimp and Texas Tackle Factory soft plastics. 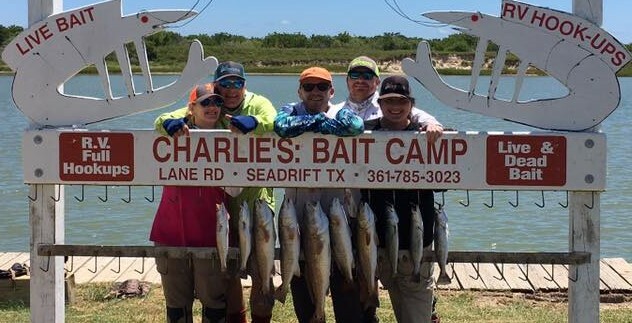 The bite is steady, and they don’t care what they eat, so come get you some at Bay Flats Lodge Resort & Marina in Seadrift, TX 1-888-677-4868. Capt. ‘Lil John Wyatt– Great times were made Wednesday and Thursday with these guys. Lots of stories were told, and plenty of fish were put in the box. It was one of those trips where I feel like there will also be a lot of stories told when they home! Good times! Capt. Chris Martin– Went grocery shopping today with Capt. Buzz Dillon. Today’s grocery store was made up of drains over mud and grass, where the tides came up along with the temperature. It was foggy early in the day, but south winds later in the morning gradually built to 15-18mph. Glow colored Corky devils worked well, along with Reaction Strike plum/chartreuse plastic tails rigged on a 1/8oz. jig-head while being dredged across the bay floor. I may not have achieved a personal-best fish today, but I certainly had a great day of fishing with a fellow fishing guide. Capt. Doug Russell– Three at a time today for a solid hour. Burning arms and a broken net, but fun! These monsters provided some great fun today, and everyone got in on the act! Capt. Perry Rankin– Well, the day started off being a bit foggy with lots of smaller fish, but Jerry and Gary finally picked up some good fish. These guys had a great time with lots of fish to take home. Looks like they will be back next year! Capt. 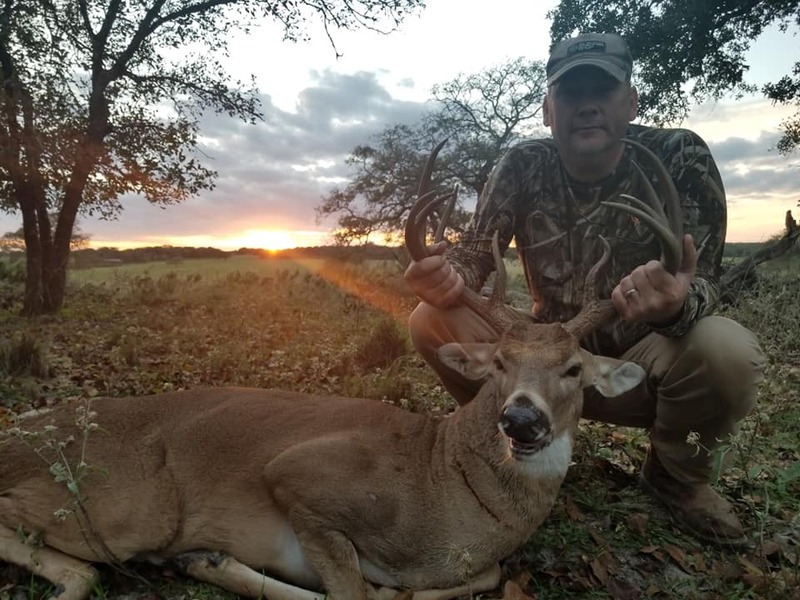 Jeremy McClelland– Got to guide some good men on Friday and Saturday with good results! The trout we found were “thick” fish (lots of meat to ‘em)! We got into some reds also that were perfect for both a tremendous fight, as well as a spectacular meal! 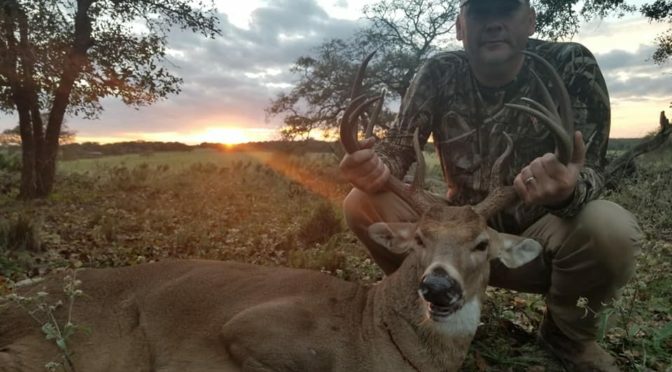 Great opening weekend in Texas! 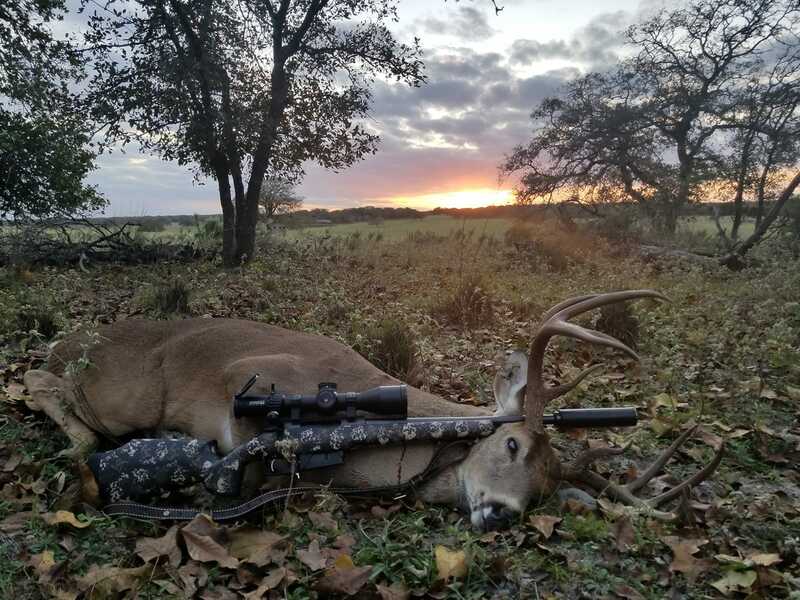 Had a great 4 days of hunting on our lease south of Seguin..
We are an MLD property and so our rifle season starts Oct 1 for does and bucks start November 1. We arrived Wednesday evening and were all really excited to get out and hunt! We all went out Thursday morning and saw activity but no shooters. I decided Thursday to hunt a new area that had some long range potential with the blind out on the middle of a field tucked under a tree. Took out the 6.5 Creedmoor and took a doe at 350 yards with Hornady 143 ELDX. 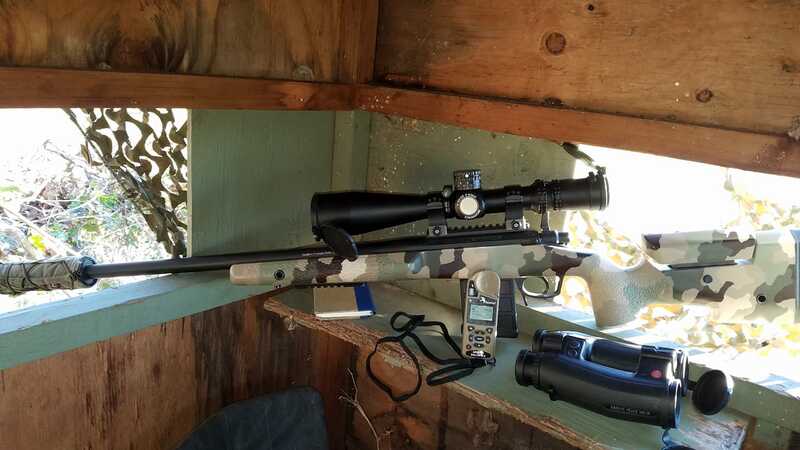 Running my Southern Precision Rifles 6.5 Creedmoor that I have ran out to 1k many times, I have absolute confidence in this rifle. Golf balls at 500 yards and clay pidgeons at 1k! 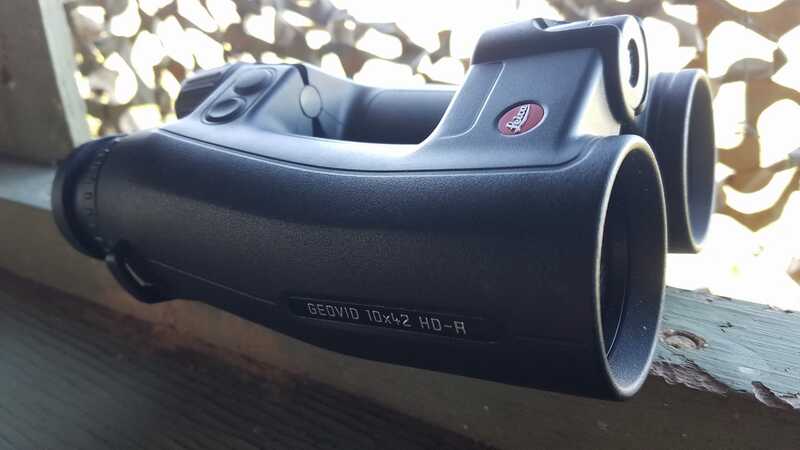 Leica Geovid HD 10×42 Rangefinding binos are awesome as well. Saturday morning my buddy Jason shot this nice wide 10 point! Saturday night it was my turn! 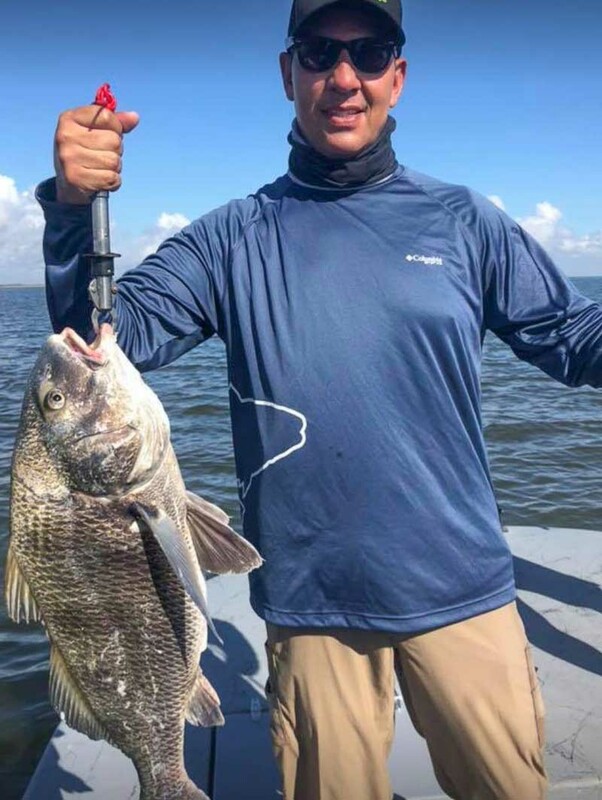 Grand Isle, Louisiana (October 24, 2018): Three-time IFA Kayak Tour Champion and Team USA member Benton Parrott has added another win to his already impressive competitive track record, taking tops at the IFA Kayak Fishing Tour Championship held October 19-20 in Grand Isle, Louisiana. This most recent win makes it Benton’s fourth IFA Kayak Fishing Tour Championship win. 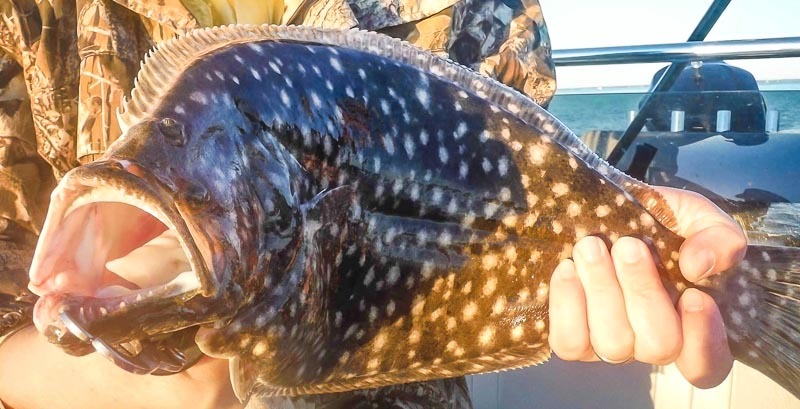 The Navarre, Florida-based angler narrowly edged out competitor Aaron Clay’s two-day, four-fish score of 120.125 inches of redfish and speckled trout with 120.375 inches, taking home a Hobie Mirage Pro Angler 14 boat and PowerPole Micro Anchor valued at $4,450 retail combined, and $420 cash in the Anglers’ Advantage program. While Parrott had planned to pre-fish the day before the event, fierce winds kept him and others off the water. Nonetheless, Friday, October 19th, saw competitors launch to compete in Day One of the 2018 IFA Kayak Fishing Tour Championship, although fishing conditions were described as terrible. “It was a grind to catch decent trout on Day One given how the wind had stirred up and dirtied the water,” says Parrott. As I halt all outdoor activities while this strong cold front bears down on us today in the middle coast I am reminded of how solid the first half of October has been. When the calendar turned to ten-one, it was almost like a switch was flipped and all of the sudden we had higher, more normal Fall water levels. The air seemed different even though a front had not slipped through. The water seemed cooler and the fish more active. The days are shorter giving way to more overnight rest. Even the crowds had thinned out around here as if deer season had already begun. Add it all up and the result was a fish almost every cast! 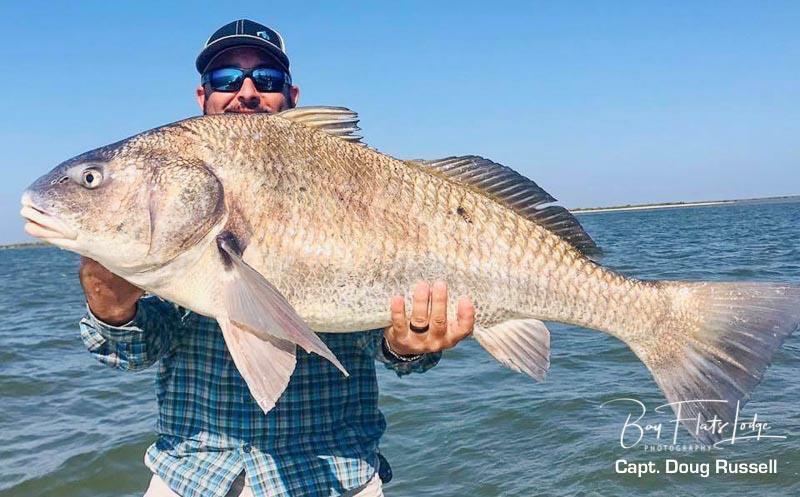 Redfish are the talk right now with numbers of undersized fish in the 18″ to 19″ range abundant. My experience has been the smaller under 10″ rat reds are not as common as these larger ones ending up on the hook. Limits of slot redfish are almost the norm with a few oversize thrown in to keep it real. I have polled our guides with text messages throughout the day and they are catching similar fish too. It doesn’t seem to matter whether it’s live or dead shrimp but they are both working better than cutters. 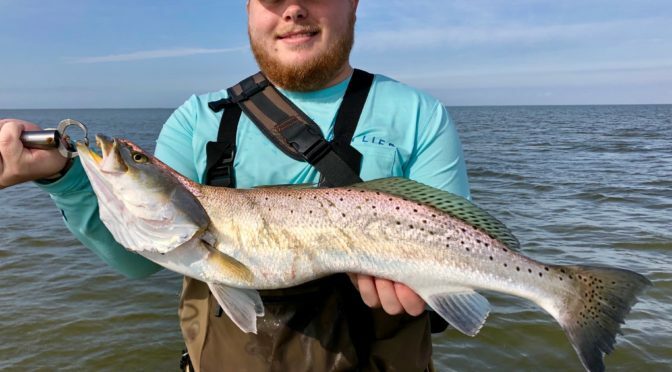 The speckled trout catch isn’t up to snuff in my trips right now like in the past few years for this time of year. Most of my guys are in the boat throwing bait and I chalk it up to the higher than preferred winds we have been seeing due to these fronts that are now blasting through Texas. I cannot seem to get out on the reefs where they have been holding because of the angry bay both before and after the fronts. The wade fishing trips however have produced impressive numbers and size of trout using either croaker or lures, true to wading year round. Black drum and Sheepshead with a rare showing of Flounder are the other species we have been boxing regularly in this first half of October. This is to say we are not limiting out on these guys but seeing good numbers. This should continue in the rest of the month and on into the end of the year. It’s no wonder why this is our favorite time of the year and why the lodge is booked almost every guide for every day. This is the perfect time to round up the family or customers and get to the coast. When you are catching a fish on almost every cast it makes you realize what a wonderful abundant resource we have in our coastal waters. There are many to thank for such a bounty aside from mother nature and the time of the year. Conservation efforts are working and you can see that in the numbers of fish we have and also in the health of our bay and our estuaries. Donate where you can to these groups and participate with your time and effort to ensure the future generations not only will have the right to fish and the waters to do so, but they will likely enjoy days like we are having right now wearing out your arms and putting some fine fish on the dinner table. 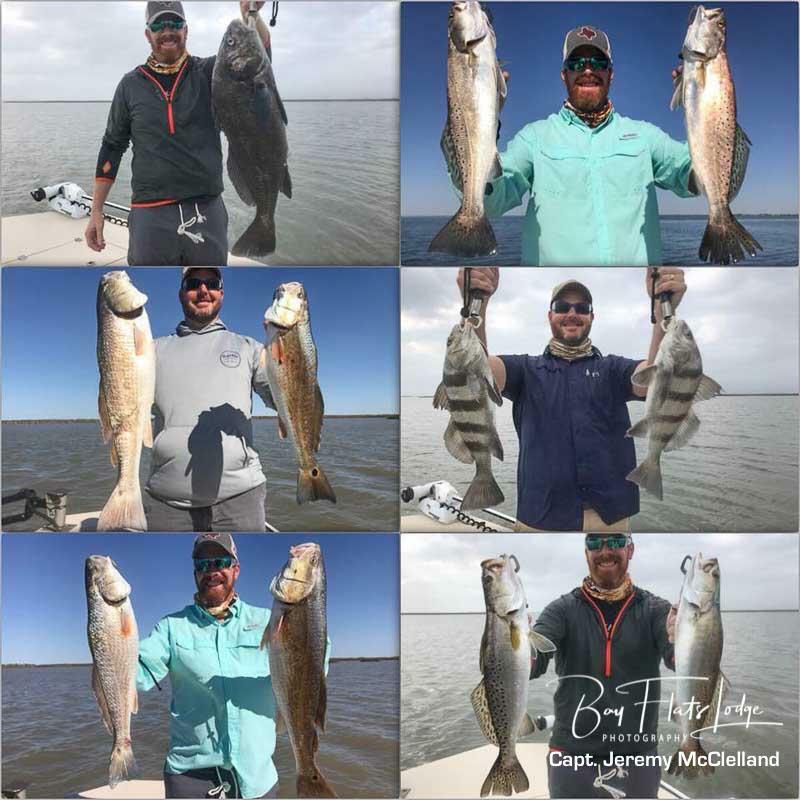 The first couple weeks of October have produced a steady flow of fish for our guides, particularly large numbers of redfish and black drum. This is probably due to the higher tides we’ve experienced so far this month, and the fact that we didn’t seen any substantial change in the weather along our coastal bend area during the first part of the month. 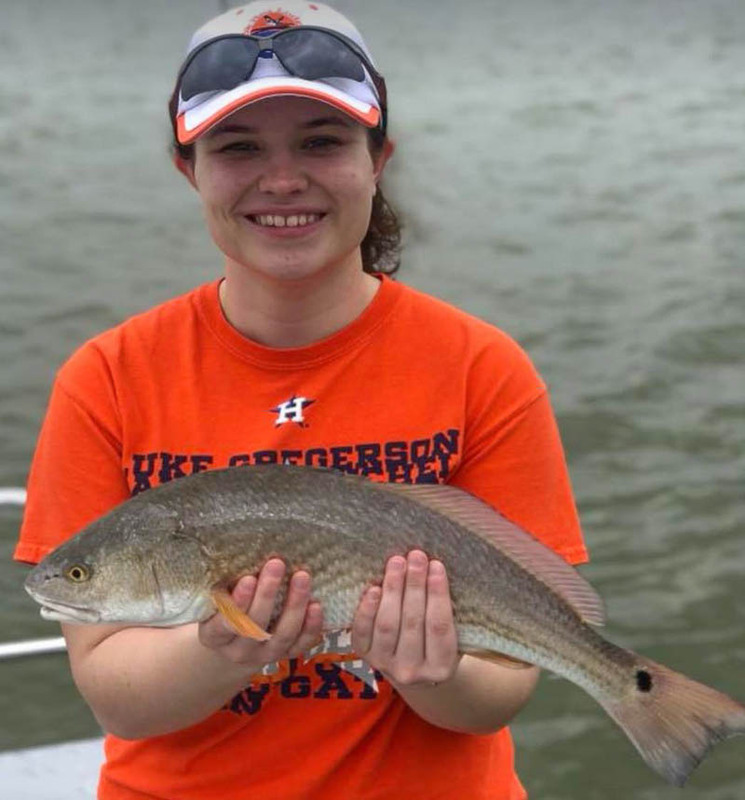 Until now, we’ve gotten a bit of rain and a brief north wind that cooled the daytime and nighttime temperatures a bit, but up until the third week in the month, trout catches have been shadowed by some really impressive catch-and-release activities on redfish. However, that’s all going to turn around for us now that the first major frontal passage has arrived. The weather is changing right now, and so is the fishing pattern as we progress into the fall season. The weather one day might be cloudy and cold, and the next day sunny and warm. It’s for this reason that anglers should look for a bottom made-up primarily of mud, not sand. The atmospheric changes are telling the fish that it is now the time for them to begin transitioning to the insulating qualities offered by that of the wintertime mud. As bay waters continue to cool, a mud bottom acts as an insulator of sorts – the mud absorbs the heat of the daylight sun and holds the heat for a much longer period of time over that of sand. Big trout will instinctively probe the bay bottom in search these warmer spots, and will look for food in surrounding areas. 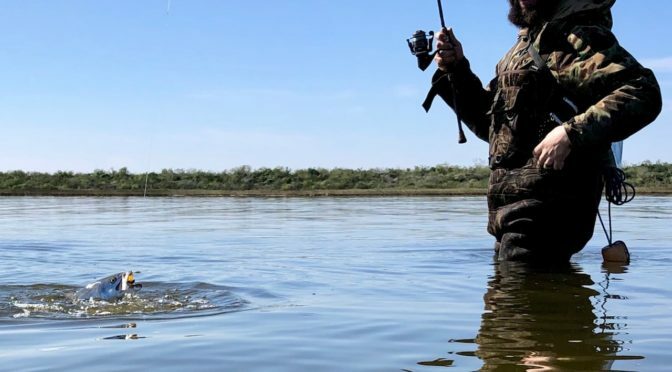 This transition to mud takes place every year at this time, and wading anglers who don’t mind getting into water with knee-deep mud can often expect rewards that outweigh the difficult walking. An effective wading pattern to exercise during this period of seasonal change is the zigzag routine. At this time of the year you may find the fish warming themselves in bright sunlight in skinny water, or they might be clinging to the depths of deeper water for security and warmth. That’s why walking back-and-forth between shallow and deep water is a good idea. Start your wade session in deeper water so you don’t startle any fish that may already be in shallow water – face the shoreline and walk toward it. Fan your casts from three o’clock to nine o’clock as you walk in a diagonal line directly toward the shore. Once you’re in shallow water, turn your back to the shoreline and walk in a diagonal line away from the shore while heading back out to deeper water. This is a proven method of attack during this changing time in the year, and it allows you to cover a lot of territory, as well. Good luck out there, and be safe! 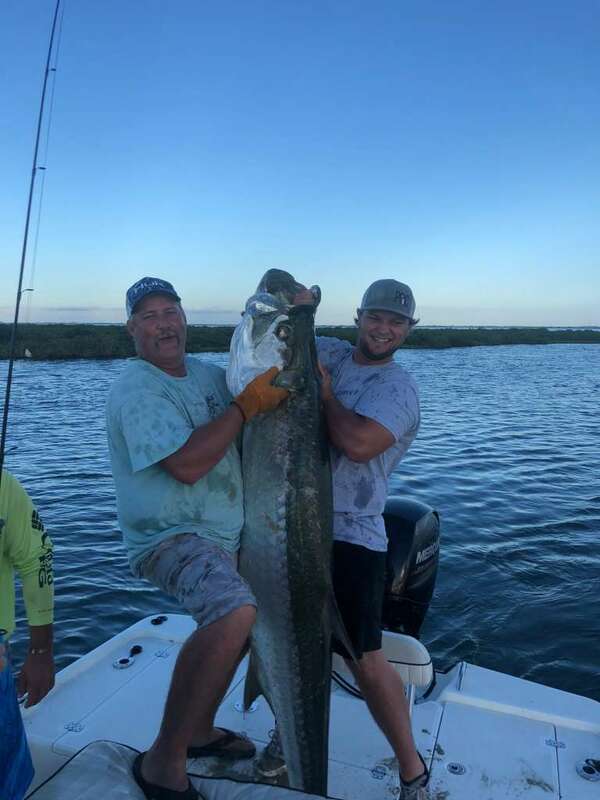 “As far as memories, that’s probably one of the best…I guess because I had both my boys and it was my son’s bachelor party,” said Greg Heine, who caught the large fish. 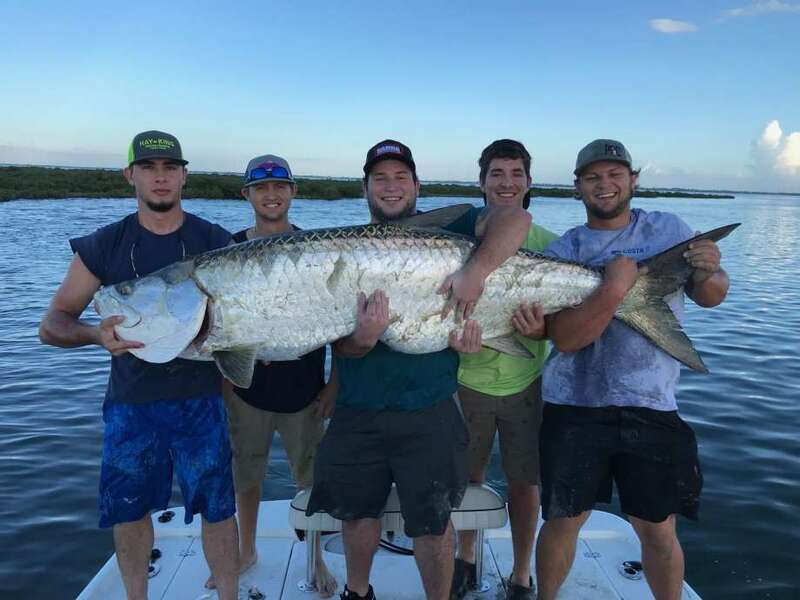 The record tarpon weighed 247.6 pounds and measured 81 inches long. 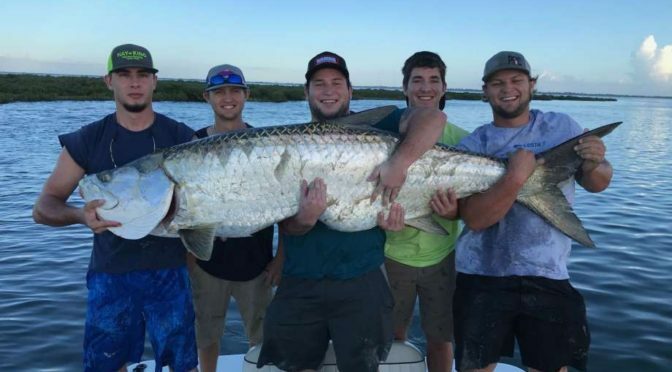 The group was fishing for bull reds and sharks in the Port O’Connor area when the giant tarpon hit.